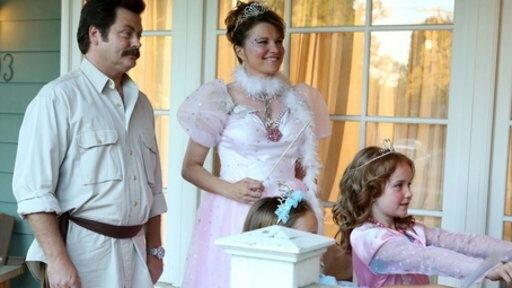 Note: Spoiler’s for those who haven’t checked out the newest Halloween episode of Parks and Rec. The first few episodes of Parks and Rec have really led up to this episode, which may be the highest point the show has achieved. Not only is “Halloween Surprise” my favorite Parks and Rec episode so far this season, but it’s a strong contender for being the best TV episode of the year. Period. “Halloween Surprise: was pretty much as good as television comes and managed to be funny and clever while also being very dramatic. This episode had a few subplots. The major one revolved around Leslie and Ben. Since the campaign Ben’s working on is sure to win, it looks like Ben would come home… until he’s offered to work with another candidate, this time in Florida. An unhappy Leslie is miserable to discover this, since she was about to lease a new house for the two of them. To cheer Leslie up, Ann convinces her to scare Jerry during the Halloween party, leading Jerry to have a “fart attack” (one of the many hilarious moments of “Halloween Surprise”). This leads up for Leslie to hold up an auction to pay for Jerry’s medical bills, reminding me of The Office episode “Stress Relief.” The characters start selling old possessions (Donna puts up her old jewelry, Ann gives away her old gifts ex-boyfriends gave her), which really give some insight on them. Ann learns to be herself, Chris starts facing his fears, and Tom comes up with a snazzy new business. Meanwhile, Ron takes out Diane and her two children with Andy trick-or-treating. I’ve said enough times before anything involving Ron Swanson equals comedy gold and this was no exception. To see Ron’s reaction to Andy running around to him breaking one of the girl’s tiaras to cheer the other one up made me laugh out loud. But for really the first time we’ve seen Ron’s sensitive side. For the past few seasons Ron has been portrayed as the tough, no nonsense, meat-loving, government hating bureaucrat we’ve come to love. In this episode, we get to see Ron really express sadness when Diane leaves him. The Emmys and Golden Globes have criminally ignored Nick Offerman, and if they do it again, I’ll take them less seriously then I do now, which is saying something. The conclusion of the episode was what really made it for me when Ben proposes to Leslie. It captured the humor and drama that goes into Parks and Rec and what used to be in The Office. No other show on TV can do what Parks and Rec does, and it doesn’t get the audience it so richly deserves. So it was another great episode for TV’s best sitcom. And it may just be Parks and Rec at its best.